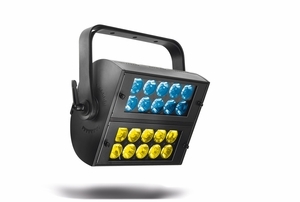 ICECOLOR 250 is a compact luminaire equipped with 20 x 10 watt RGBW LED light engines offering an infinite palette of rich pastel or saturated colors. Fitted with an ultramodern fanless cooling system, this IP65-rated luminaire can be integrated seamlessly into any environment in which absolute silence is a must. Compatible with a wide range of holographic filters, the ICECOLOR 250 meets all needs where compromise on precision and efficiency is not an option. It is, in fact, equally suited to illuminating a cyclorama with its 80° filter as to long-distance use without filter. The ICECOLOR 250 is a luminaire that respects the environment thanks to its 85% plus efficiency optics, enabling it to produce an overall lighting flux in excess of 5000 lumens for only 200 W of power consumption. The ICECOLOR 250 is a pioneering and exclusive tool for demanding lighting designers. The total silence with which it operates, its infinite color options and large choice of beam angles make the ICECOLOR 250 the ideal projector for 21st-century settings.